As wives, isn’t it so difficult to remember that we’re special? After the excitement of dating, engagement, and a wedding settles down, life rolls right along. I remember how much I wanted to get married and how special I thought marriage would be. Then, once I finally got married and my husband and I settled into life after our honeymoon, marriage became a normal part of life. Marriage became so normal, in fact, that if I’m not careful, it’s easy to take it for granted. It’s easy to forget what a special gift it is. Just as it’s a little too easy to become overly comfortable with marriage, we, as wives, can forget that marriage is a really good thing. That verse is HUGE. And humbling. Do you feel like a good thing? Proverbs 18:22 doesn’t mince words. Finding a wife is a good thing. Marriage is a good thing. And as a wife, you are your husband’s good thing. Some days you may feel like you are. And other days, you may feel like you aren’t. Some days your husband may treat you like you’re a good thing and a human representation of the Lord’s favor. And other days, he forgets. Or he doesn’t acknowledge it. Can I offer just a bit of encouragement? If and when your husband doesn’t treat you like you’re his good thing, try not to take it personally. Of course it’s hard not to. But so often in life, you have to choose the right thing to do and you have to choose to obey God, regardless of what is happening around you. As you do this, be careful not to blame your husband for failing to value you. Instead, share with him that you don’t feel loved or appreciated. Ask if there’s a way you could help him to love or appreciate you more. If anything, this should get your husband to consider how he treats you. And it will let him know that you do notice how he treats you. Are you obviously a good thing? 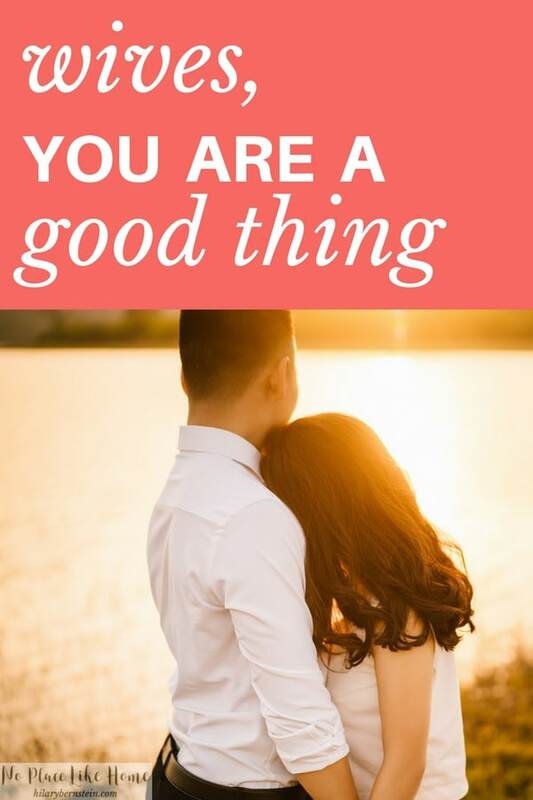 Before you focus on how your husband is or isn’t valuing you, I have an important but hard question to ask: Are you acting in a way that it’s obvious that you are your husband’s good thing? Or are you not? When you read Proverbs 18:22 about obtaining favor from the Lord, do you feel like you are a living example of the Lord’s favor? If you know you are, keep up the good and hard work. Continue to fill your husband’s life with blessings. Be the Lord’s good thing that your husband can be thankful for. Keep on keeping on. But if you know you struggle in this area, it’s time to start making changes. It’s time to renew your determination and become the good thing the Bible promises. That might mean that you need to evaluate your expectations, learn to love your husband more, understand him better, or even become a better listener. You can start by working on the way you appreciate your husband. Try a little tenderness. And, above all, be sure to pray for help and inspiration. As you make an effort to be your husband’s good thing, you’ll be blessed in the process. Not only will your effort please the Lord (and your husband! ), but you’ll also find a surprising satisfaction. And you might even start to realize how special – and what a good thing – you are as a wife. Wives, what helps you remember and act like you are a good thing for your husband?